Vol. 3 no. 11 & no. 12 of al-Majalla al-Tijarriya contains: an analysis titled "Egypt's Unfavorable Trade Balance;" "Mr. Vanderlip's plan for a Bank of the United States of Europe;" a piece advising businessmen on how to prepare for the future; a profile of Russia's economic conditions; a general review and news of economic conditions in the United States; and Salloum Mokarzel's editorial. * The original Arabic description of the newspaper indicates that this issue is for the months of November and December (i.e. no. 11 & no. 12) of 1921, while the English description only refers to the month of November (no. 11). Salloum A. Mokarzel and Syrian-American Press, “Syrian-American Commercial Magazine Vol. 3 No. 11 & No. 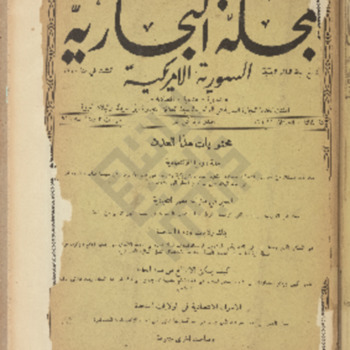 12,” Moise A. Khayrallah Center for Lebanese Diaspora Studies Archive, accessed April 20, 2019, https://lebanesestudies.omeka.chass.ncsu.edu/items/show/13949.